Last night I finished up the deeds I needed in Eregion, including doing 40 quests in the region. Nothing super-tough; my Lore-master is smacking faces and taking names these days and my trusty bear is always there to lend a hand. As I’ve been going back through all of these zones on this character, I’ve been reevaluating them. 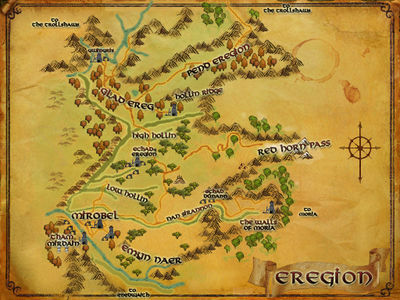 Eregion used to be a welcome alternative to the grossness of Angmar, pleasant and open to explore. However, now I’m seeing it as a lot of nothing. Apart from the instanced area that leads up to the gates of Moria, it’s such a bland region with so little to define it. A few ruins, hills, scattered trees. It’s kind of interesting to meet the Dundlanders, but that’s not enough to set my underpants on fire. The quests aren’t much better, to be honest. There are loads of kill ten rats, as most everyone is just passing through and wants to give you busy work. There are plenty of early LOTRO zones that I’d like to see reworked with more quests, better landscape, and an improved quest flow. Eregion isn’t as high as, say, Trollshaws and Misty Mountains on that list, but in comparison to any of the expansion content, it really is kind of pathetic. You’d think that the developers would have taken more advantage to the Fellowship passing through (although seeing Bill the pony is a nice bit). Anyway, I just have Angmar to go and then I’ll be diving back into Moria. Wish me luck! I am thankful that your underpants are not on fire. What I remember of the region was the smooth transition from quest hub to quest hub. It just did a good job of keeping you going in a direction that ultimately ended up at the door of Moria. Oh, and yeah, LI’s dropping like crazy and quickly figuring out your bag space is too small and you lose nothing by simply dropping any you can’t use. Some zones have more “staying power” than others. When Eregion was first released it was anticipating the entry to Moria, and that alone was excitement enough. Each quest hub led you closer to the Doors of Durin. It gave you a reason to enter Moria for the first expansion, instead of just dropping you at the door. Now, after running Moria countless times and sick of that place as well, Eregion loses that sense of anticipation. I do like the ring-lore quests. The rings of power (except Sauron’s) were forged there, after all. That alone is pretty darned cool. If I recall Eregion correctly, I enjoyed its scenery greatly because it was such wide open plains, with wild flowers and grasses. Lovely to ride around in. Quest-wise, well, none of that lodges in my memory anymore. It’s supposed to feel empty and devoid of excitement because if you recall it was empty and devoid of excitement. It was just rocks, trees and crebain until the Fellowship rolled in (oh, and the thing in the pool, can’t forget him) and then after they entered Moria it was rocks, trees and crebain and one pony legging it north. It would feel wrong to have that drastically altered. One thing I still love about visiting Eregion is the musical score. There are a couple of really cool pieces of music in Eregion that I haven’t heard in any other region.